information between departments and the citizens of Guthrie. First, this division maintains and supports four networks within the city. Second,GTV20, the city's cable channel is operated by this division. Third, city websites are maintained by Information Services. The Web Marketing Association announced the winners of its 14th Annual International WebAward Competition in September. Competing against hundreds of other entries, the City of Guthrie, received the Government Standard of Excellence at the awards ceremony. The WebAwards recognize the talented individual and team efforts in creating outstanding website development and generating internet marketing exposure for the award winning website. Entries were judged on seven criteria on a scale of 0-10: design, innovation, content, technology, interactivity, copywriting and ease of use. The Web Marketing Association is the producer of the WebAward Competition. The WebAward Competition is the premier annual website award competition that names the best websites in 96 industries while setting the standard of excellence for all website development. Juggle.com is a research website that provides information about a variety of popular topics through an online encyclopedia and a free reference resource. This information serves as an excellent online reference website for students, educators, researchers and business users. 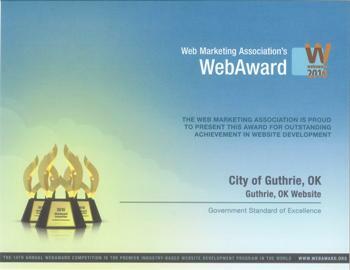 Recently, Juggle.com recognized our website by awarding the City of Guthrie the Top City Government Website Designation. Four cities in Oklahoma received this recognition and were judged on the criteria of usability and content. These sites are recognized as going beyond typical city government website by including highly accessible information and strong interactive design as well as highly effective information presentation.